After serving on the law school’s trustee board for a number of years, J. Richet Pearson was named as the interim dean in September 2001. She became permanent dean in May 2004. With her appointment, she is the fifth dean in the school’s history. Serving with distinction were Dean George Jones, Dean David Barnes, a Birmingham municipal judge, Dean Ralph Cook,a former Alabama Supreme Court justice, and Dean Emory Anthony, a former Birmingham municipal judge. Dean Pearson is a Birmingham, Alabama native. After completing grade school in the Birmingham School System, she received her high school diploma at The Altamont School, later graduating from Princeton University in Princeton, New Jersey, in 1981. She enrolled in the University of Alabama Law School and graduated in 1984. 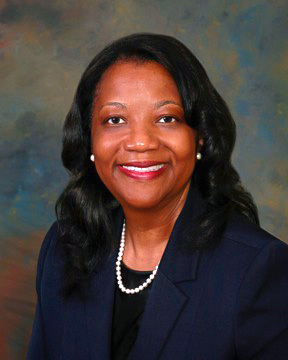 She passed the Alabama bar in September of that year and began a one-year clerkship with Alabama’s first African-American federal judge, The Honorable U.W. Clemon. Dean Pearson is a practicing attorney in Birmingham. She is a member of the Thirgood Christian Methodist Episcopal Church, its Board of Trustees, and a Board Member of the Alcohol and Drug Abuse Treatment Centers, Inc. – Pearson Hall.